Minimum number of clues in middle Su-Doku of a Samurai? The subject explains it all. The intersecting boxes must be empty. The upper bound is 8 because I know that there was a (very old) Times Samurai Su-Doku puzzle like that. Re: Minimum number of clues in middle Su-Doku of a Samurai? 999_Springs wrote: The subject explains it all. The intersecting boxes must be empty. 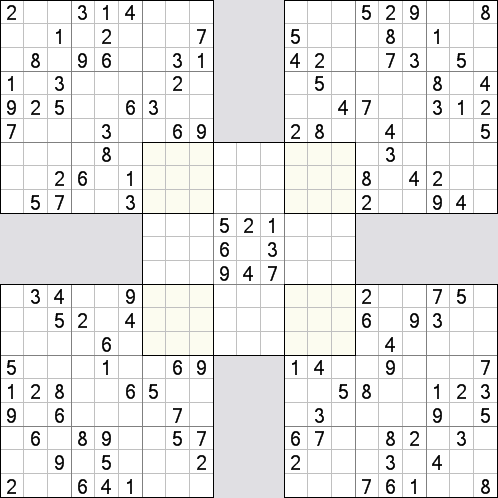 The upper bound is 8 because I know that there was a (very old) Times Samurai Su-Doku puzzle like that. I don't know, but here's one with only seven clues. None of the five component puzzles can be solved independently. . . . . 7 . 1 3 6 . . 7 6 . . 8 . .
. . 2 . . . . . . . 4 . . 8 . . .
. . 8 . 6 7 . 5 2 . 3 . . . . 5 9 .
. 2 . . 4 3 . 7 . . 1 .
. 1 . . . 9 9 . 6 4 . .
. . . . . 9 7 8 7 . . 6 .
. . . . . . . . . . . . . . . . 3 .
. . 2 . . 6 . 7 5 . . . . . . . . .
. 9 7 . . 1 . 4 2 . 7 . . . . . . .
. . 3 4 2 . 1 7 . 6 3 9 . 5 . 7 . I'd be interested to know how long it takes you to solve. It is ... erm ... not easy to solve. Right. In fact, as far as I can tell, it needs a global technique. The desperate solver can be helped by the single hint below (not in the middle puzzle). Last edited by m_b_metcalf on Tue Sep 16, 2008 7:45 pm, edited 1 time in total. And here's another, not symmetric, but with only five central clues, and all in the same box.
. . . 1 2 3 4 . 5 . . 9 . 6 . 2 . .
. . . . . . . 2 . . . . . . 7 . . . . 4 .
. 3 . . 4 8 . . . . . . . . . . . 6 . . .
9 . 1 . . . . . . . . . . . . 8 . 5 1 . .
. . . 3 7 . . . .
. . . . . 6 . . .
. . . . 2 4 . . .
. 5 . . . 7 . . . . . . . . . 2 8 . . 5 .
. . . 7 9 . . 3 . . . . . . . . . .
. . 1 8 6 3 9 7 . . 4 . . 5 3 . . .
. . . . . . 2 . . . . . . . . . . . In a limiting case, sufficient information can flow between the five sub-puzzles for the four corner ones to be solved completely. What is left is a central puzzle with its corner boxes full. We know that one other box must contain some clues, namely the central one (otherwise there are pairs of empty rows/columns), and that it must contain at least two clues positioned such that there are not two rows (or columns) intersecting it that are empty. The lower limit is certainly higher that this, but is at least two. My attempt to go below five was unsuccessful. I tweaked my generator to search for it, but the best it could find is another 5.
. . .|. . Y|. . .
. . .|. . .|. X .
. . .|Y . .|. . .
where the additional three clues needed for a solution in the central puzzle are provided by the corners. To be investigated. P.S. Did you know that, in your symmetric 8-clue puzzle above, clue '2' is redundant? m_b_metcalf wrote: To be investigated. After some further attempts to go below five, I'm giving up. I'm prepared to believe that four is possible, but am unwilling to search further for it. After some further attempts to go below five, I'm giving up. I'll have my generator try for one more night before I give up. Did you know that, in your symmetric 8-clue puzzle above, clue '2' is redundant? Yes, but removing it would degrade the symmetry.
. . . 1 2 3 4 . 5 . . . . . 9 . . . 2 . .
. 4 . 6 . 7 . . . . . . . . . . 2 3 . 7 .
. . . . . . . . . 3 7 . . . . . . . . . .
. . . . . . . . . . . 6 . . . . . . . . .
. . . . . . . . . . 2 4 . . . . . . . . .
. . . 7 9 . . 3 . . . . . . . . . . . . .
. . 1 8 6 3 . . . . . . . 4 . . 5 3 . . .
To establish whether 4 clues in the central box can produce a valid puzzle (together with all 4 corner boxes), I am searching the ED grid catalog (by band) prove or disprove this notion once and for all. Testing of sample bands for the 5 clue case shows 1% to 2% of grids have this property. Testing of the 4 clue case is underway, every indication so far suggests it can't be done. Completion will take a few days … only one core is available. Testing this in real life is easy … I did mention a similar way in the Kazaguruma empty middle grid thread. 2. Strip all clues from central grid except for central box for each solution grid. 3. Solvable Stripped down grids are kept & the rest discarded. About one-crossing-free pattern, previous discussions have been done here. For patterns with givens in multiple boxes, we have to check one-by-one, but it is not to hard to prove that 4 is impossible(if so).